WASHINGTON (CNN) -- Kansas Gov. Kathleen Sebelius is a leading contender to become the next secretary of the Health and Human Services department, two senior administration officials told CNN. However, the officials stressed that President Obama is still checking out several other potential nominees for the critical job of shepherding his health-care reform plan through Congress. Officials say Kansas Gov. 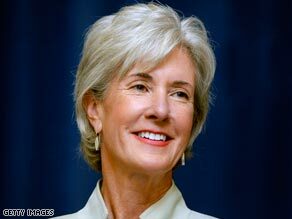 Kathleen Sebelius has a good personal relationship with President Obama. White House spokesman Bill Burton cautioned that "no final decision has been made" on the post, which is still vacant after the first pick, former Sen. Tom Daschle, stepped aside after questions were raised about his failure to pay more than $100,000 in taxes for use of a car and driver. "There are other candidates still very much in the mix," said Burton, who declined to name the others. He would only say the president will make a decision "soon" about the Cabinet selection. CNN reported earlier this month that Sebelius met in Washington with senior White House adviser Valerie Jarrett about the job, a sign that the administration has been giving her a close look since Daschle dropped out. The officials noted Sebelius has a good personal relationship with Obama and remained in the running for the vice presidential slot until near the end of the process. She was also considered for other Cabinet posts. The other candidates who have been considered, according to Democratic officials, include Sen. Ron Wyden, D-Oregon, Tennessee Gov. Phil Bredesen, a Democrat, and former Democratic Sen. Bill Bradley of New Jersey.